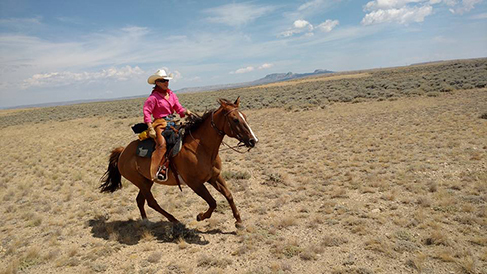 Blue Sky Sage specializes in horseback riding vacations that offer qualified riders the opportunity to ride safely at faster gaits across the open range. This active riding style is a hallmark of the company, and Blue Sky Sage is one of very few companies still offering this type of vacation in the United States. These trips are designed to be for adults only, so the minimum age is 16 years old. 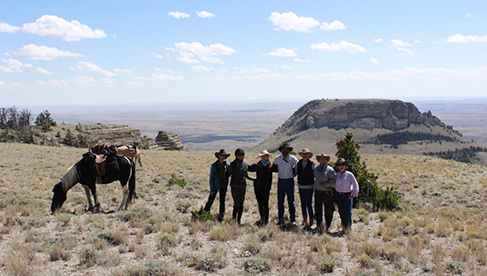 Small groups, a simple, yet comfortable camp, good saddle Horses, the wide-open spaces of Wyoming, and the personal attention and full-time presence of the owners, Mike & Bobbi Wade, all combine to make your Blue Sky Sage experience unique, and a destination adventure you will want to return to. On any given year, over 65% of our guests are multi-year return customers; this is a testimonial we are quite proud of, and humbled by. Book Now to Get Your Preferred Week & Itinerary! Advanced Skill Level Riders only on these weeks. July 1-7 Girls Ride Out! Horsewomen, only 5 openings left! June 21-27 Girls Ride Out! Horsewomen, only 4 openings left! 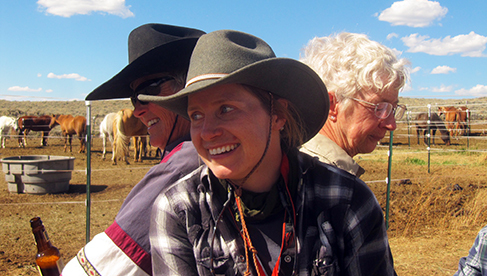 July 11-17 Horsewomen of a Certain Age Horsemanship Horsewomen, only 5 openings left! July 21-27 Guys Ride Too! Mixed Group, only 2 openings left! September 3-9, 2017 (Sunday through Saturday) "Alumni Week" TENTATIVELY BOOKED FULL! 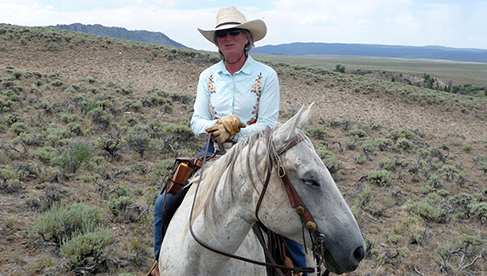 Each of Blue Sky Sage's equestrian vacations are limited to a maximum of eight (8) riders, only six (6) riders on very experienced weeks and Mustang Horse Adventures. Plan on arriving in Jackson, Wyoming on the day before the trip start date and flying out on the day after the trip end date. There are a lot of things you can't get out here - There are a few things here you can get nowhere else. Like the freedom to be your own person; simplicity and a return to a straightforward way of doing things. Blue Sky Sage promises you will get all these things and more, set in the middle of expansive western Country, with a willing Horse as your partner. Ride with the Mike & Bobbi Wade - You are personally invited to join the us for the fourteenth season of these unique horseback riding vacations. One or both of us guide every ride ourselves, every day, so you are assured the experience and expertise of our 36+ years as professional outfitters, guides, and horsemen are shared throughout your vacation. Active Riding On Good Horses - Blue Sky Sage Horseback Adventures are not to be confused with dull "nose to tail" trail rides. The rides are safe and controlled, yet physically active. Where practical, riders ride abreast and extended gaits such as the lope are favored, when and where appropriate. 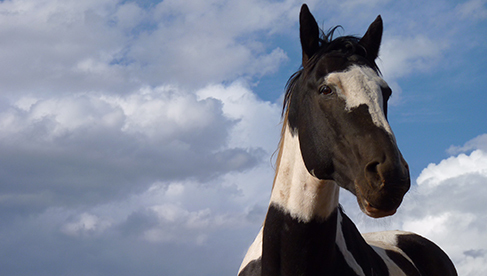 We maintain a horse cavvy of around 25 head of seasoned horses that are mostly foundation Quarter Horses, with some draft-Quarter cross, and some mustang-cross horses. Natural horsemanship philosophies and methods are practiced and taught throughout the week. The instruction is not formal, but ongoing, practical application whenever you are around the saddle Horses. You will be a much more confident and knowledgeable horsewoman at the conclusion of your horseback riding vacation. 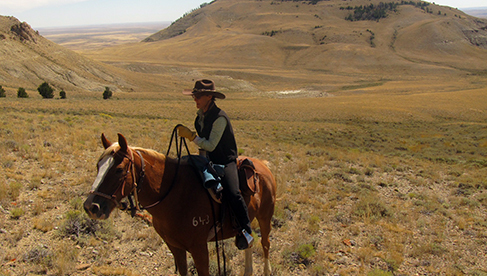 Wide Open Spaces - When you are riding with Blue Sky Sage you will be horseback in the midst of the wide-open spaces of Wyoming, with 100-mile vistas stretching between the horizons. This tall and uncut Country is the home of the true western perspective. 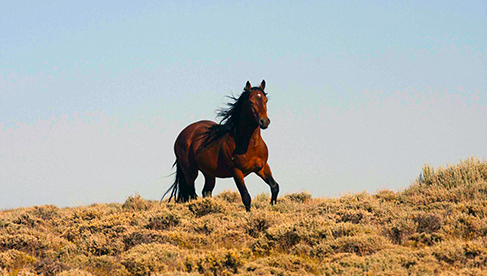 Cowboys, wild horses, historic trails, and ancient Native American campsites are still a part of this landscape. The fences are few and far between, "civilization" is a long way off and the freedom to ride is limited only by your desire. . . .
Away from the Crowds - A smaller group means more personal attention on your horseback riding vacation . 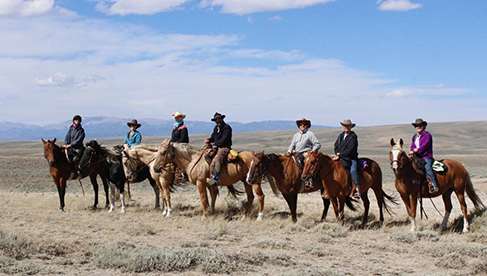 . . One of the greatest benefits that you will enjoy when you choose a Blue Sky Sage horseback riding vacation is the intimate, exclusive experience that is not often found on a dude ranch vacation, pack trips, working ranches or other trail riding vacations where 12-50 riders are common. A smaller group means more personal attention, more privacy and more individual space. 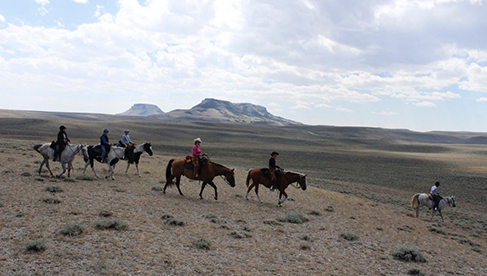 You won't get lost in a crowd at Blue Sky Sage; group size is limited to six enthusiastic riders per week. The special campsite along the Little Sandy River is definitely not your standard, "cookie cutter" version of the typical dude ranch. In fact, this is not a dude ranch at all, but a wilderness sanctuary. For those who are looking for a place that is closer to the Earth, more in tune to the rhythms of nature and the wilderness, yet offers everything necessary to be comfortable and secure, the camp setting where the Blue Sky Sage rides originate is the perfect home away from home. Think of the soothing melody of running water over smooth stones, with the harmony of a summer breeze through tall lodge pole pines to lull you off to sleep. The quiet of your own canvas tipi tent, with a warm sleeping bag on a comfy mattress for a bed are better than the best king sized bed in a luxury resort for restful sleep. The privacy and peace of the wilderness enhance the accommodations of the Blue Sky Sage wilderness camp. Every individual guest is set up in their own tipi, with larger tents available for couples or those who want to share. In addition, there are private shower tents with hot water showers ready after we get in from the days' ride or, the river right beside your tent may beckon you to take a dip in the crystal clear water to cool off and wash off the dust of the trail. Another feature of Blue Sky Sage that our guests have popularized over the years are the meals that our various Dutch oven camp chefs have prepared over the years. The cookhouse and those who work within produce the fabulous meals that have become a tradition. The Blue Sky Sage menu features organic grass-fed buffalo, and includes wild Alaska salmon, grilled chicken, crisp salads, fresh fruits, natural cereals and yogurt, vegetables, pasta, homemade biscuits and breads, and if you still have room, desserts made from scratch. We can accommodate vegetarians and gluten-free requirements. Our Dutch oven camp cooks are all experienced with preparing a variety of specialty hors de' oeuvres as well, to accompany our BYOB daily cocktail hour after the horses are put up from a good days' ride. Yellowstone National Park; Grand Teton National Park; Jackson Hole, Wyoming; Oregon Trail; Pony Express Trail; South Pass City State Historic Site; Wind River mountain range; Great Divide Basin and Red Desert wild mustangs. Mike Wade: “The small family ranch in eastern Wyoming where I was raised provided me with the perfect environment to start my lifelong outfitting, guiding, and outdoor career. Mountains and badlands called on the horizon, instilling a outdoor wanderlust that still has not been satisfied. My father Jack, gave me a solid background with horses, the perfect way to explore the backcountry, and my mother Ellen encouraged me, as well as my four siblings, to pursue whatever our spirits suggested. Immediately after high school, I started packing mules and guiding guests into the Teton Wilderness, the most remote location in the lower 48 states. Since that time, I have guided many thousands of guests in various pursuits across most of Wyoming, including extensively in and around Yellowstone National Park, with brief experiences in Arizona and Montana. After 36 years, mountains of worn-out horseshoes and boot leather, and hundreds of snowmobile tracks, this lure to explore around the next corner and over the far horizon is as strong as ever. I look forward to sharing my next horseback adventure with you”. Bobbi Wade: “I was raised on ranches along the banks of Rawhide Creek. 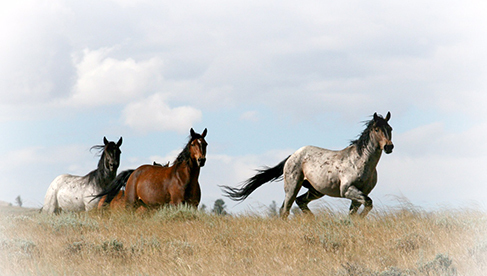 Horses have played a big role in my family dating back to my great-grandfather Samuel Seaman, who after moving on from his cowboy job at the Node ranch around the turn of the century started his own horse ranch to raise mounts for the cavalry out of Ft. Robinson, Nebraska. 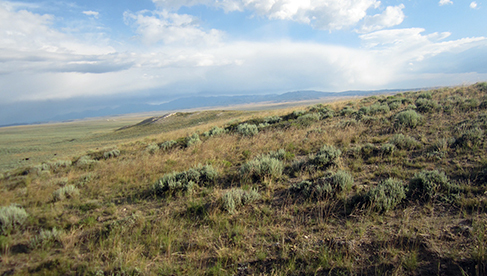 He started his ranch in the chalk butte hills north of Lusk, Wyoming that were eventually named after him. My grandpa and my mother Shirley cared on raising horses, and when she married my dad Robert Hladky they kept the bloodlines in their personal saddle cavvy. Dad was a cowboy and ranch foreman, and I grew up learning to ride and work cattle right alongside the cowboys. Later on, me and my three siblings became dad’s main ranch hands and we did everything on the ranch that any man would have done in the old days. Dad taught me to rope at a young age, and I competed through high school in the roping events. Though I was usually working outside, Mom did manage to instill in me some cooking and cleaning skills that have been invaluable over the years! My other passion was, and still is, vocal music of all genres. I taught myself to play guitar starting at age twelve to accompany myself while singing. My love of music and horses, combine with an outgoing personality was a good combination to bring to the wilderness; I started my outfitting career as a cook’s helper and campfire entertainer on pack trips then went with Mike back into a wilderness elk hunting camp located 56 miles horseback ride from the trailhead, to cook and wrangle horses. 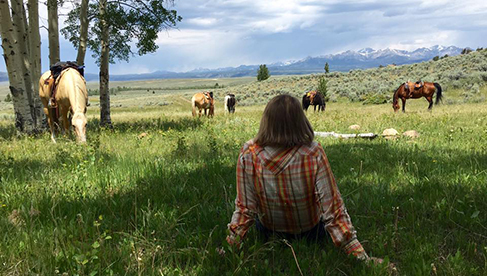 All these years later, I’m still working at doing a little of everything I’ve learned and our life together is an ever-continuing story of new adventures, great people, good horses, and a love of Wyoming that we still take great pride in sharing with others”. 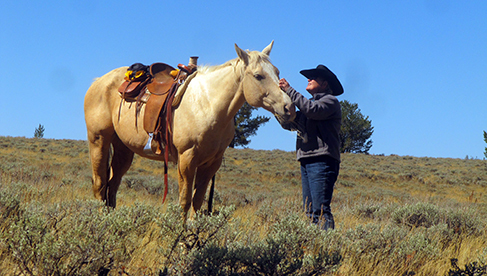 Our long and varied career has taught us that the best approach to a successful and enjoyable horseback vacation for all our guests requires a handful of simple, straightforward things. 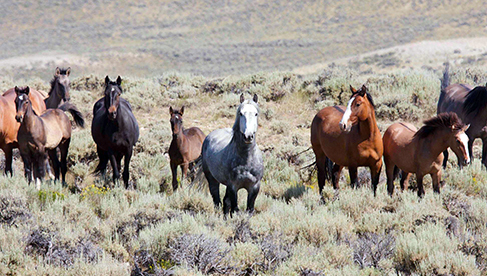 Those things are to provide an active, hands-on horseback experience for small groups of people, active, well-mannered saddle horses to ride, remote locations that put folks in the heart of the real wide-open spaces, and a comfortable wilderness camp atmosphere. These features provide every guest with the individual attention they deserve and appreciate. We have both lived a very adventurous life and in spite of coming from a background that was very isolated and sheltered from the mainstream, (or as we joke, we were raised "at the head of the creek") somewhere along the line we knew we wanted to share the best things about the Cowboy way, as we knew and believed them to be, with people who had a sincere interest in experiencing what for us is a life, and a very good life at that. 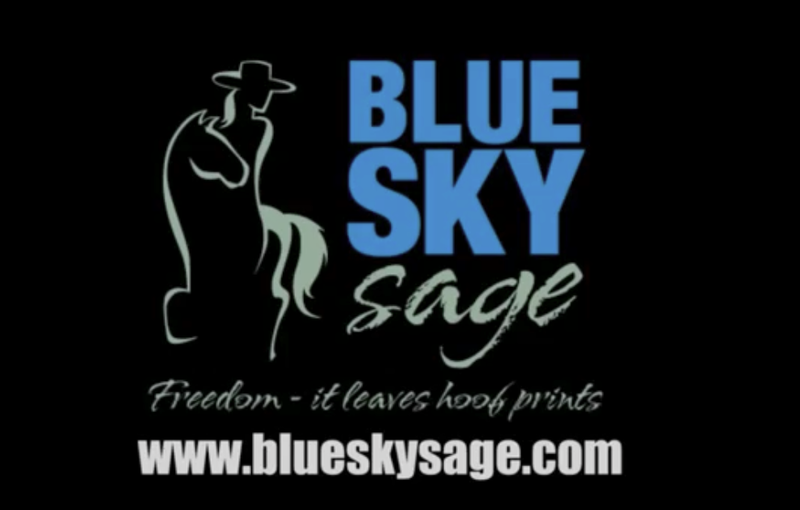 It is our belief that Blue Sky Sage is a genuine reflection of what we have lived and what we envision. There is always an open invitation to you to pull your cinch, catch a stirrup and ride for the high points with us across these wild, wide-open spaces we call home. Great Divide Basin, Wind River Mountains, Jackson Hole and Yellowstone regions. Intermediate, Strong Intermediate, Advanced, some Novice with caveats. 6 Riders per week, 10+ weeks per year; non-riding traveling companions welcome. Visa, MasterCard, Cash, Personal Check. 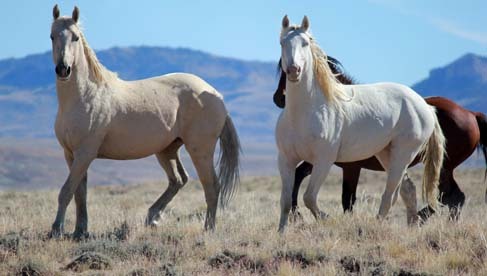 Travel Agents- This horseback riding vacation provider works with Travel Agents.